More than 150 million Web surfers around the globe celebrated Korean Independence Day Aug. 15, 2001. Well, at least for a few moments while they were visiting the popular Internet search engine Google. That day, the Korean national flag and several roses of Sharon, the Korean national flower, adorned the familiar "Google" logo on the homepage of the Web site. 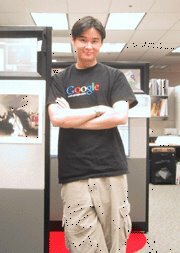 Just another day's work for Dennis Hwang (Hwang Jung-moak), a 23-year-old Korean computer artist in the United States , who has been drawing the face of Google for almost two years, creating a buzz of sorts with his simple yet witty designs.